As we step out of our house, we find advertisements hovering all over. Be it on buildings, billboards or buses. This is basically the essence of OOH advertising. As the name suggests, it is advertising that an individual is exposed to when he is out of his home. It is marketing a person’s view at public places, in transit or at some of the commercial and retail locations. According to a PricewaterhouseCoopers' report, the Indian OOH market would grow to Rs 1,800 crore this year, growing at 17 per cent per annum. The relevance of OOH has grown over the past few years in the country with many retail brands taking up this advertising medium. Billboards are the most traditional form of OOH advertising mediums. Billboards can be seen everywhere, be it on streets, round abouts, traffic lights or above buildings. Innovation has reached this medium as well and the latest from the scene are I-Boards. 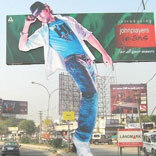 I-Boards are a display, a sequence of rapidly changing advertisements on a billboard. Built on the internet technology, these can be of a single host or by different retail advertisers. Wallscapes are of a relatively newer origin but are very effective and are now seen more often than before. Street furniture displays mainly focused to urban centres refer to bus shelters, news racks, mall kiosks and so on. These are usually located near the commercial and shopping centres as they are the significant point-of-sales. This form of advertising consigns with the placing of advertisements on moving vehicles like buses, trucks, and taxis. This kind of advertising has become extremely popular lately as it puts across the message loud and clear in a crisp way. The breakthrough from a cluttered up medium is the biggest advantage for opting this medium by the retailers the world over. The ability that it has to reach out to their customers at various touch points is another benefit it brings along. As more and more people are on the go these days, it poses as the perfect option for retailers to market their propositions to their target audiences. Local advertising can be best put across by the use of OOH advertising. It is a cost effective medium which can be personalised as it is flexible and can be moulded with innovation. OOH displays can catch the attention of customers even during rush hours when people may be stuck in traffic. The OOH industry is primarily young in India and is at a far end compared to its counterparts around the world. Being at a very nascent stage, the industry still lacks the required amount of research and innovation that it requires to grow to its true potential. Government regulations in India also need to be addressed for the industry to seek a brighter side. Even with all these hurdles, the industry is turning out to be a significant important medium for the retailers. According to PWC, the industry is expected to grow at a cumulative 10.8 per cent CAGR to reach Rs 25 Billion in 2013. So it for sure, is an industry to watch!